I June Dairy Month has been filled with a variety of activities just like this tour yesterday of the Bill and Delia Haak dairy farm in Gentry as a part of the statewide Water Quality Conference. I'm thankful for our friends in agriculture that provide assistance to all farmers-- from providing technical information to passing out the cheese at an event! 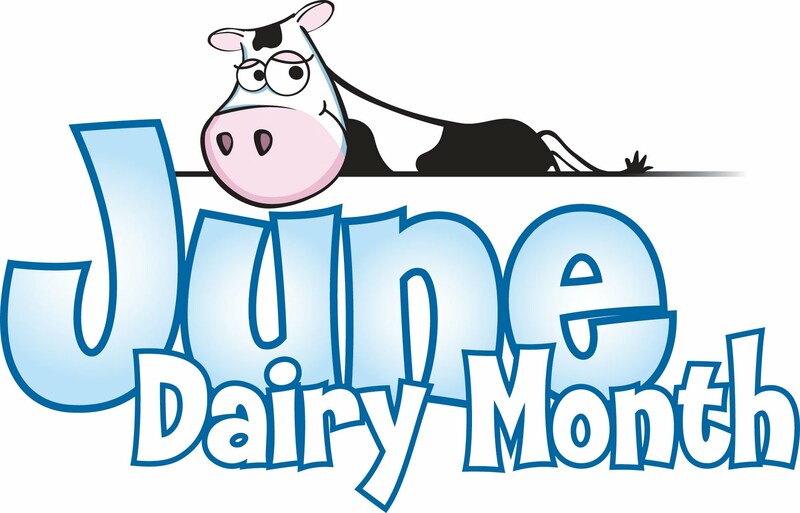 Have you noticed that cute dairy cow hanging on the June Dairy Month logo? That's our Midwest Dairy friend, Bessie, the Dairy Makes Sense icon. I love this cow because her expression reminds me of a few of our Holstein cows that are often waiting by the gate, hoping for someone to leave it open so they can get into the next pasture. Although June Dairy Month is quickly coming to an end, you can always find Bessie in her pasture at http://www.dairymakessense.com/. Bessie may have different expressions or seasonal outfits through the year, but she will always make sure to have great dairy nutrition information, a place to learn more about dairy farming,recipe ideas for meals and snacks and a place to get answers to your dairy nutrition questions. Promotion of dairy products with icons like Bessie don't happen by accident. Since 1985, dairy farmers have been funding the National Dairy Promotion and Research Board. Dairy farmers contribute fifteen cents per one hundred pounds of milk produced on each farm to fund this program. Our money is used collectively for promoting dairy on the national,state and regional levels and for the research and development of new dairy products to meet consumer demands. Information that we provide is factual and based on sound science and research. Bessie and the Dairy Makes Sense website are a great example of how dairy farmers in the Midwest Dairy regional promotion area are providing useful information to all consumers in a fun and engaging way. Thanks for celebrating June Dairy Month with me and Bessie at Spotted Cow Review and don't forget to check out Bessie's pasture through the year! Dairy smoothies are a great way to get refreshed from the summer heat and get your daily dairy in a sweet treat. In these last few days of celebrating June Dairy Month and summertime temperatures on the farm and in the city, I think this is the perfect recipe! I found this recipe on The Pioneer Woman blog entry of August 5,2009. Place yogurt,fruit,milk,a handful of ice and honey to taste all into a blender. Blend until smooth. Taste it for sweetness and add more honey if needed. You can find other smoothie recipes at http://www.midwestdairy.com/ or http://www.dairymakessense.com/. What is your favorite dairy smoothie recipe? I'd love to hear from you! It is impossible to party during June Dairy Month without bringing recognition to the heart of our dairy story---our cows! We milk a total of 300 cows twice daily every day of the year. Our herd consists of Holstein dairy cows ,one Guernsey and three Ayrshire. Our cows are the present and future of our farm. We respect them for what they provide for us and we work diligently everyday to provide nutritious feed,clean water, and comfortable surroundings. I enjoy watching the growth and development of each animal that we raise from calf to milking cow. 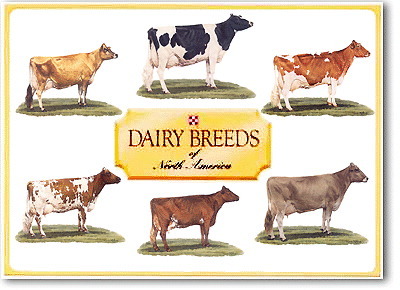 There are actually six different breeds of dairy cattle: Ayrshire,Brown Swiss,Guernsey, Jersey,Holstein, and Milking Shorthorn. Each breed was developed in its own country and brought to America. 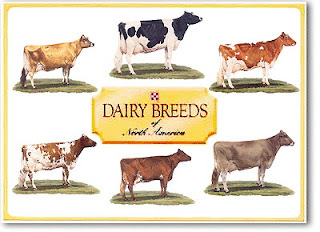 You can find more information about each breed at http://www.dairyfarmingtoday.org/. June Dairy Month is the perfect time to celebrate our product and the commitment of America's dairy farm families working everyday to provide high quality milk by taking good care of our cows! With the added activities of crop planting and hay baling, supper time meals are often late in the evening on the dairy farm and that makes the cook (that's me) a little cranky because I don't like cleaning up the kitchen at bedtime! To celebrate June Dairy Month and less time in the kitchen, I plan to try this recipe this weekend. Place a foil sheet, approximately 12x12 inches,on a work surface. Spoon about 1 teaspoon of the barbeque sauce in the center of the foil. Place one chicken breast half over barbeque sauce and spread another teaspoon of sauce over chicken. Top with quarter of the potato,bell pepper and onion. Sprinkle with a little of the salt and pepper. 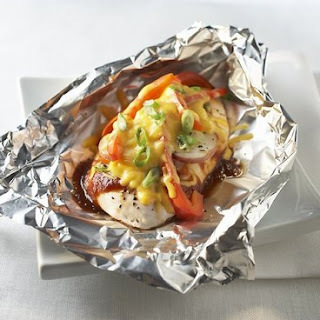 Fold foil in half to cover contents; make narrow folds along edges to seal. Repeat with remaining ingredients to assemble three more packets. Place the four packets on a baking sheet and bake for 35 minutes. Open foil packets with scissors and carefully pull back edges as contents may be very hot. Sprinkle a quarter of the cheese over the top of each chicken breast and return to oven, unsealed for two minutes or until cheese is melted. With a spatula, transfer the contents of each packet onto individual serving plates. Substitution Idea: One cost savings tip is to buy bone-in chicken breasts and remove the skin. You can find this and other great recipes at http://www.dairymakessense.com/. I'm feeling less cranky just thinking about this easy recipe! 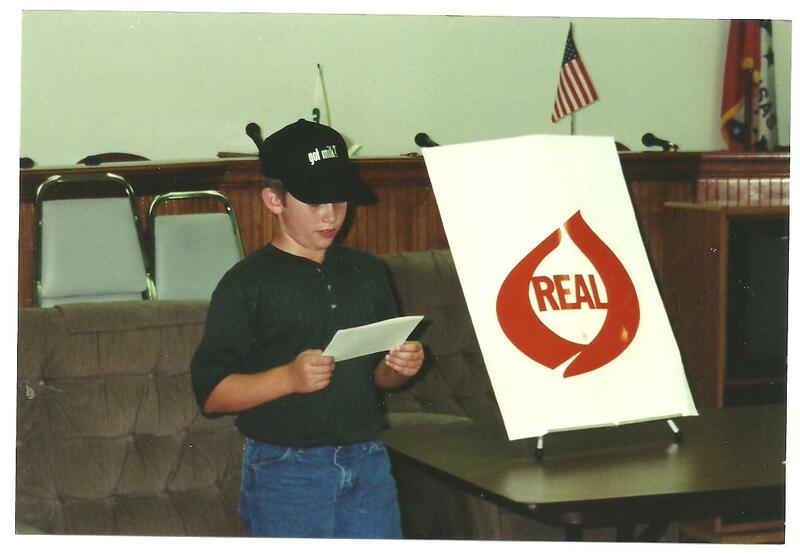 Cody gave one of his first illustrated talks in 4-H about the "REAL" Seal. 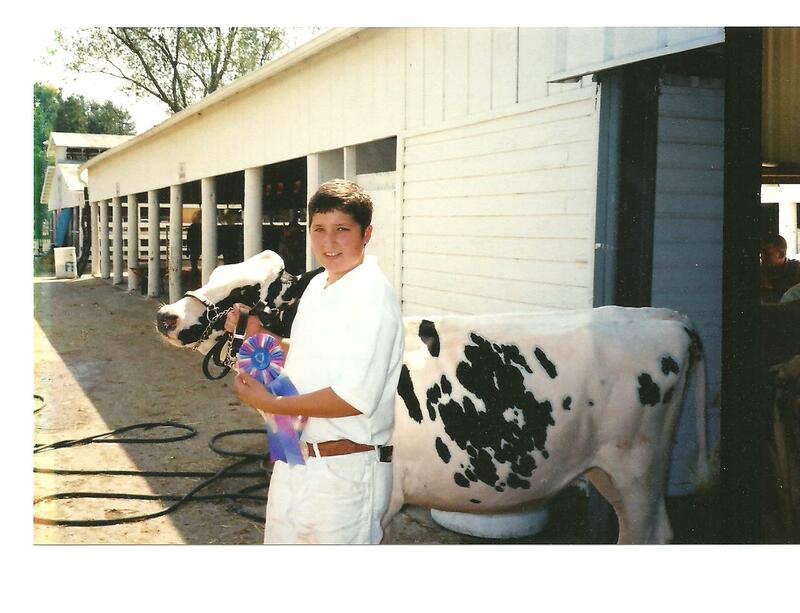 I'm thankful for all the experiences in 4-H and on the dairy farm that have shaped this young dairy farmer. Last week as we were feeding baby calves, one of our employees asked me if I had seen the baby ducks on our pond that is located just down the road from the dairy. This is also the pasture that is home to several Holstein bulls. It's not unusual to see ducks on the ponds, but the description given for these sounded very unique. After we finished calf feeding, I picked up my camera and headed for the pond. To my sheer delight, I found what I now know are a pair of Egyptian geese with their eight goslings enjoying what appeared to be swimming instruction time. After observing the family for a short time, I returned home to send a picture to my birding friend to find out more about these interesting birds. I'm not sure why they have chosen Northwest Arkansas as their home, but I did find out that a pair of them have been around our farm for the last ten years. This is the first time we have seen any Egyptian goslings. I suppose it was a blessing that the pasture around the pond is full of bulls right now. There was no worry of me being attacked by the geese because I stayed on the outside of the fence with a bull's eye view! 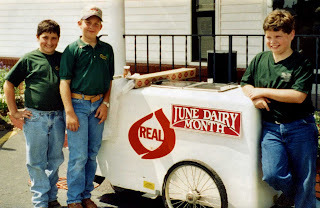 I really feel like my celebration of June Dairy Month actually started in April with our annual 4-H Dairy Recipe Contest sponsored by the Benton County Farm Bureau Women's Committee. One of the most important judging criteria is the creative use of dairy products in each recipe. Using all these delicious dairy products is a dairy farmer's dream come true! After all the recipes are judged and winners selected for both main dish and party category, we get to sample all these delicious dairy recipes. What a dairy delightful experience! To celebrate June Dairy Month, you might want to try this winning main dish recipe submitted by 4-H member Ty Connolly. Heat oven to 350 degrees. Spray 13x9 inch baking dish with cooking spray. In 10-inch nonstick skillet,melt 2 teaspoons butter over medium-high heat. Cook onions and bell pepper in butter 1 minute,stirring occasionally. Remove from heat; set aside. In 2 quart sacuepan,heat the water,half and half,milk and 1/4 cup butter to boiling; remove from heat. Stir in both pouches of potatoes and seasoning just until moistened. Let stand about 1 minute or until moisture is absorbed. Beat with a fork until smooth. Stir in 1 cup of Monterey Jack cheese with peppers and 4 ounces of 1/3 less fat cream cheese cut into cubes; stir till blended. Gently fold in 8 ounces of light sour cream and 4 ounces of chopped green chilies. Mix the potato mixture,the pepper and onion mixture and 1 1/2 cups of cheddar cheese together. Spoon into a 13x9 inch baking dish. Sprinkle with another 3/4 cup of cheddar cheese. Arrange meat evenly over cheese. Drizzle barbecue sauce over the meat. Sprinkle remaining 3/4 cup of cheddar cheese over the meat. Bake at 350 degrees for 45 minutes. Let stand 10 minutes before serving. Garnish, with tomato pieces and sliced green onions. As an Arkansas dairy farmer, I can truly say that June Dairy Month is a great time to celebrate not only dairy foods and the dairy industry, but also give recognition to the support that Arkansas dairy farm families have received from our state. 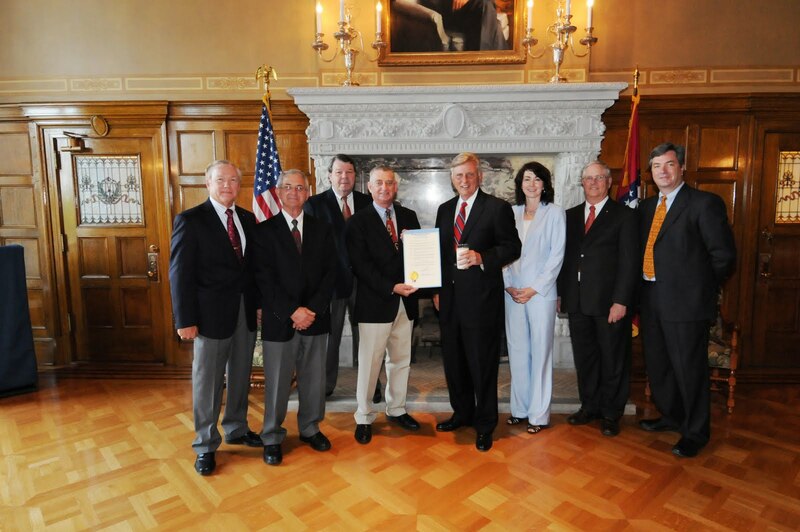 Due to the rapid decline in the number of dairies in our state, the Arkansas legislature established the Arkansas Milk Stabilization Board in 2007 to work to ensure a minimum supply of milk for the population of our state. We truly received help to save our dairy farms in 2009 when the Arkansas legislature funded a two-year program to provide incentives to state dairy farmers with a goal to stabilize or increase milk production within the state. 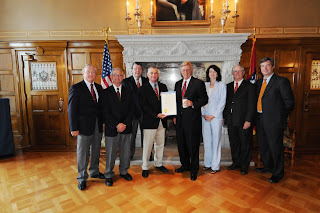 I can never express enough thanks for the support all Arkansas dairy farm families have received from Governor Beebe,the state legislators,and the members of the Arkansas Milk Stabilization Board. I hope that we will always have dairy farms in Arkansas producing our state beverage--Milk! You can learn more about Arkansas dairy history or dairy nutrition at http://www.encyclopediaofarkansas.net/ or http://www.midwestdairy.com/. In just a few days, dairy farm families will be celebrating June Dairy Month at the annual 4-State Dairy Days cattle show in our county. I'm thankful for events like this that teach our children so many life lessons and give opportunity to develop long lasting friendships with other dairy farm families! 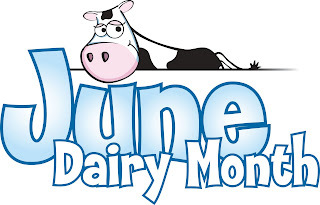 You can't celebrate June Dairy Month without cheese! Well, I guess you can but why would you want to? Celebrate June Dairy Month with this easy pleasing recipe! Preheat oven to 375 degrees F. Set up three bowls with the following: 1)flour;2)an egg-wash;made by beating the eggs and milk together; 3)cornflakes mixed with cheese. Coat a 13x9 baking pan with non-stick cooking spray. Dip chicken pieces in flour, then into egg-wash,then roll in the cheesy-flakes mixture, coating the entire piece of chicken, and place on the baking pan. Discard any unused cornflake mixture after coating chicken. Bake fro 25 minutes, turning halfway through to ensure even browning. Serve with ketchup or BBQ sauce if desired. This recipe was created by Chef Jon Ashton of Orlando Florida and featured in the 30 Days of Dairy fact sheet from http://www.nationaldairycouncil.org/ and recipe section of http://www.midwestdairy.com/. Keeping up with information about our dairy cows is an important part of our dairy farming operation to insure healthy dairy cows and quality milk. One of our best tools for managing our herd information is through Mid-South Dairy Herd Improvement Association. This association is a complete professional testing,management and reporting system for dairy farmers. Once a month, Greg, our Mid-south Dairy Herd Improvement technician, will come to the dairy farm to collect milk samples from each dairy cow during the morning milking. Each sample will give us information about the individual cow's milk production and qualities of the milk that include butterfat,protein, and somatic cell counts. Before Greg comes to the farm for this testing, I will have recorded all herd health information, breeding and calving records into the computer system. After each cow is sampled, Greg will enter the milk weight information on our computer system , transmit all of our records to the Mid-South office in Springfield,Missouri and send the milk samples to the lab for analysis. A few days after the test day, we will receive paper copies of the test information and be able to download the test information to our computer system. Managing our dairy herd with information that we obtain from tools like our dairy herd improvement records assists us every day in making sure that our healthy herd is producing quality milk. June Dairy Month--it's all about healthy cows,quality milk, and the dairy farm families that work everyday to produce a great product! and fun experiences while members of the Benton County 4-H Udder Club. Watching these three dairy farm boys dip the ice cream was a memorable experience! I am thankful for all the fun we have promoting the dairy products we are proud to produce.